The sun was out but there was what would most generously be described as “a stiff breeze” blowing down our little valley. At times, it felt like a gale. Nonetheless, we’d lugged our bicycles with us about 700 miles down France so we thought we should be brave little campers and use the poor things. 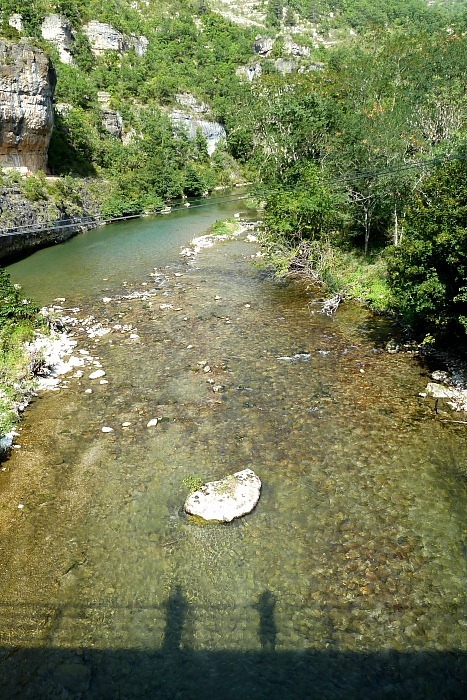 Since we are not actually French and in no way inclined to cycle up steep inclines such as those which head up the mountains surrounding Millau, we thought we’d head up the Dourbie valley, straight into the aforementioned stiff breeze. Hmmm! I have to say it wasn’t a lot of fun; it was damned hard work. Being a river valley, the road went slightly uphill anyway and, with the added resistance offered by a strong wind blowing down the valley, the effective gradient was greater. The faces of those cyclists we passed being blown back down the valley were noticeably much more relaxed than ours. We were rather looking forward to the return trip with the wind but we stuck it out for 10 miles/16kms before spinning around. 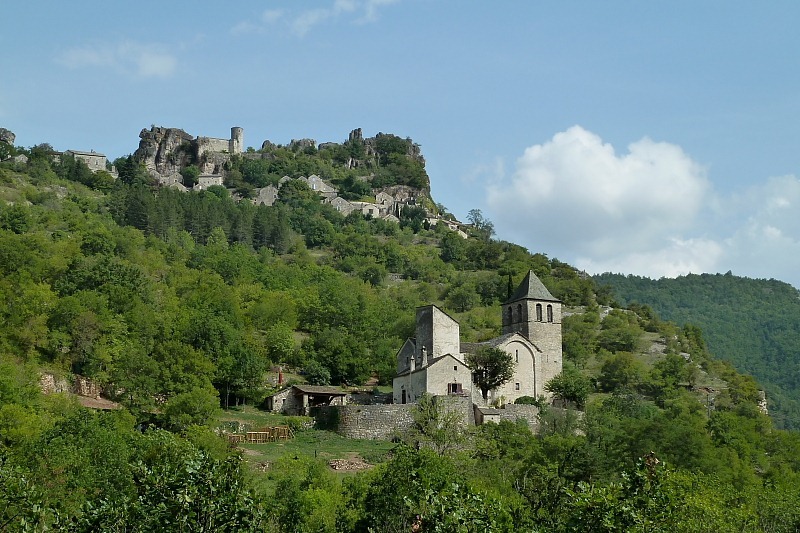 The French tourist board had thoughtfully placed St. Véran at our chosen turning point to enable a natural breather while the little snappy camera did its work. Finally, here’s a sign we’ve seen little of in France. 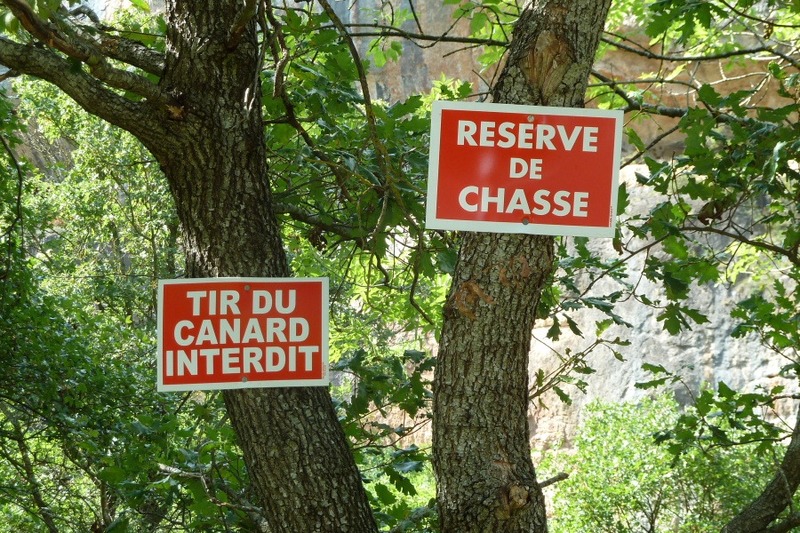 Well, it’s two signs screwed to a tree but the left-most reads, “Tir du Canard Interdit” [Shooting of Ducks Prohibited]. Maybe we should call back into La Brenne on our journey back north and let the poor ducks there know that there is at least a little safety for them 300 miles south down here – if there’s any ducks left, that is!